If you haven't yet made it to the waterside for your first outing of the season we do hope that you will get the chance very soon. The extra days away from work over Easter might just be the perfect opportunity. The advice is the same as always - don't leave it too late and find that some of the best of the year's fishing has already slipped by. We have lots of lovely flies just waiting to help you make the most of your day. Meanwhile, back in 2016, the smaller stillwaters are going strong right now. As always, some of the very best of the year's fishing at these popular and productive places is during the early months, before water temperatures get too high. The big reservoirs are also opening all around the country right now. With a combination of good numbers of fish from this year's stocking and the chance of a hungry over wintered lunker it's a great time to be on the bank or in a boat. Here's a super brownie caught by great friend Chris McLeod, fishing a Hare's Ear on a floating line from the from the bank at Rutland on opening day (slightly out of season I think but he was always going to be returned anyway). Lovely weather for anything but fishing - and look at that water clarity!. On the rivers front the trouting will get under way very soon, with a lucky few enjoying March Brown action from the start whilst steady numbers of salmon are being recorded via Fishpal and other websites on a daily basis. 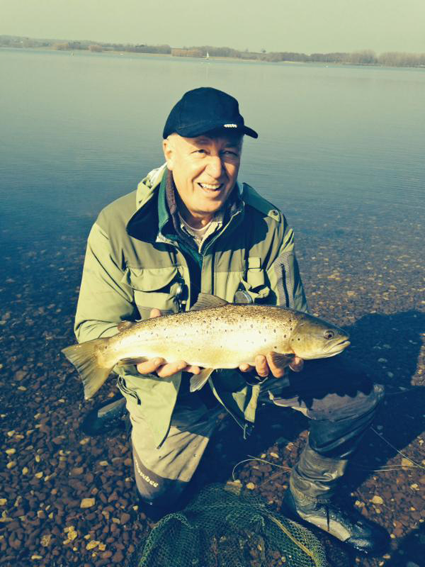 Four friends had a spectacular start to their season last week at Crathes Castle on the Dee. Having worked hard for one fish in their first couple of days, it all came good on Saturday when every one of them caught a fresh run springer - four fish is a fantastic day but to share them around so evenly is remarkable! The successful fly? - that perfect choice for a good height of early season water - the (Dee) Monkey designed for the river by Danish fly fisherman Jimmi Lauridsen and named after the Colobus Monkey from which the hair for the original fly was taken. As many of you will know, we recently introduced the Selectafly Barbless Range of flies. They have been immensely popular and, with hindsight, we wish we'd done it sooner. The feedback has been fantastic. We are currently struggling to keep up with demand for the top sellers and doing everything we can to bring in fresh supplies. Apologies in advance if you are affected - this level of orders took us by surprise. We will be back on top of it soon. There are also new patterns from both Fulling Mill and (coming soon) from our own Pro Range. 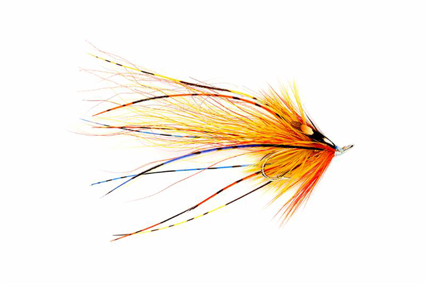 Fulling Mill have a number of stunning new salmon and sea trout flies from the vice of Ronnie Sutherland, together with some sophisticated additions to their saltwater range - with a focus on tarpon - some interesting new crabs too. Slightly less to report on the trout front but the new buzzers certainly caught my eye. 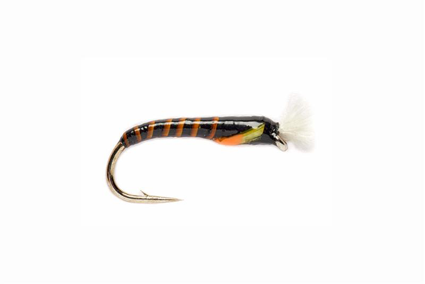 Find all the new flies from Fulling Mill here. 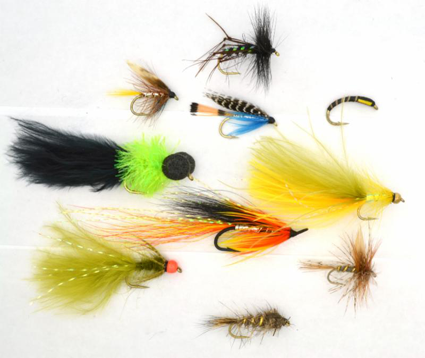 Don't forget that we sell every fly in the Fulling Mill catalogue (and all the 'non fly' items in there too). Shipping is fast - normally same day for orders received by 3.00 pm - and First Class P & P is FREE for online orders over £10 (flies only, sadly we can't do this for bulky items which are classed as parcels). Finally, on the new flies front, you may have heard of the new translucent Fritz material which is making such a big impact on the stillwater scene right now. If not you probably will soon! The good news is that the super quality T15 material is with our tyers right now and we hope to have both barbed and barbless versions of these flies available for you next month. As I reported in a previous email the time for a price increase across the Original Range has now arrived. It will be the first for more than 5 years and is essential to allow us to make the quality upgrade we are now delivering across this range. All Original Range flies are now being tied on the UK's best loved and most trusted fly hooks from Japanese manufacturer Kamasan. The hooks are complemented by top quality materials from Veniards and a dramatically improved standard of tying (at a substantially increased cost to us!) Our objective is not to simply create the cheapest flies on the market but to deliver the right balance of a good looking, consistent, reliable product at a great price - typically less than half the price of the same pattern from the UK's market leading fly company. Have a look at the photo below and judge for yourself. The price increase is planned for the end of this month so stock up quickly if you want to avoid it! Finally, if you're looking for a focussed selection of flies, e.g. 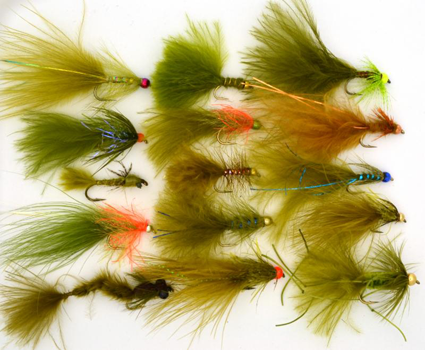 Buzzers or Mayflies then have a look at the Selections we have put together with Trout Fisherman magazine. No 'passengers' here - every fly has earned its place and the selections are available at a significant discount to the cost of the individual patterns. Do get to the water soon and Tight Lines when you do! P.S. Our 'Bin End' flies have been very well received (with one canny customer coming back several times for more salmon shrimp flies - more than 180 in total!) Supplies are limited so don't wait too long if you're tempted.